Today, while in Walgreens looking for a snack I happened upon the kettle corn section. 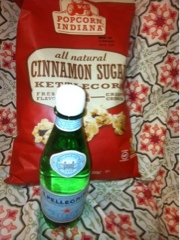 I have been a fan of kettle corn for a while now. In fact, my entire family is highly addicted to the kettle corn sold at our local Costco from the Angie's corn brand. It comes in a large yellow bag and is truly delectable. But, Walgreens did not have such a brand. So I was required to try something new. 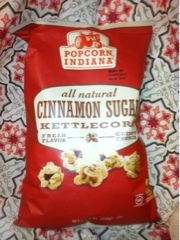 I opted for the kettle corn brand and the cinnamon sugar flavor it's definitely a different flavor. Not one I dislike, but not what I was expecting. I really enjoyed the sweetness of the sugar. It reminded several teachers of the children's cereal Cinnamon Toast Crunch, but better. I don't know how often I will seek it out. But, I do recommend giving it a try. 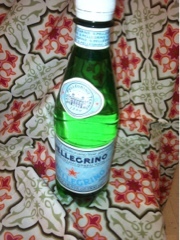 While at Walgreens I noticed that pellegrino water was on sale. Since I have never actually had it before, I decided to go ahead and give it a try as well. I drank it several times throughout the day and while I don't know if it will ever be the first choice I make over something else, it definitely was not bad. All in all, tasty new treats.